When was the last time you have taken a break from your hectic lifestyle and spend a calming day with your family members and friends up Penang Hill for some fresh air while be mesmerized with the beautiful panoramic scenery of the island? For MyKad holders, it’s RM10/pax (adult) or RM4/pax (senior citizen, child & student). 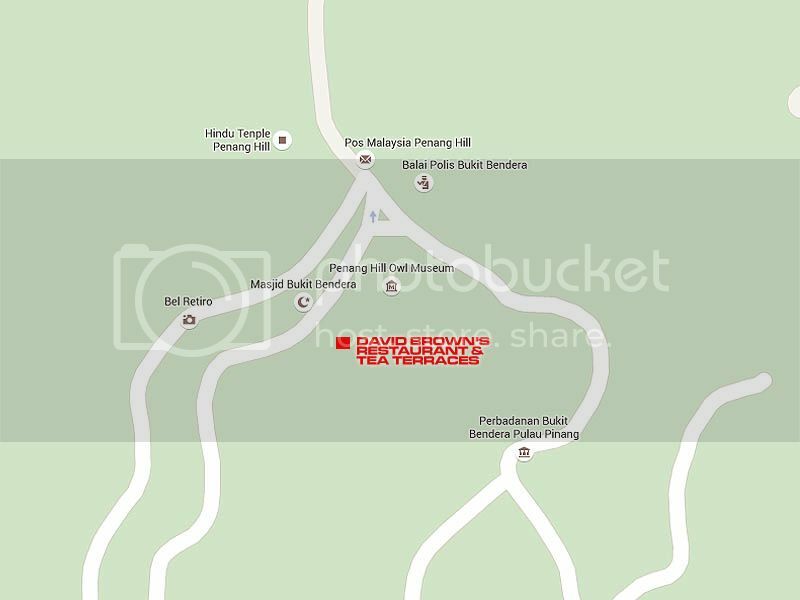 As for visiting tourists, it’s RM30/pax (adult & senior citizen) or RM15/pax (child & student). Daily train operation hours will be 6.30am-11.00pm (last train from top station). 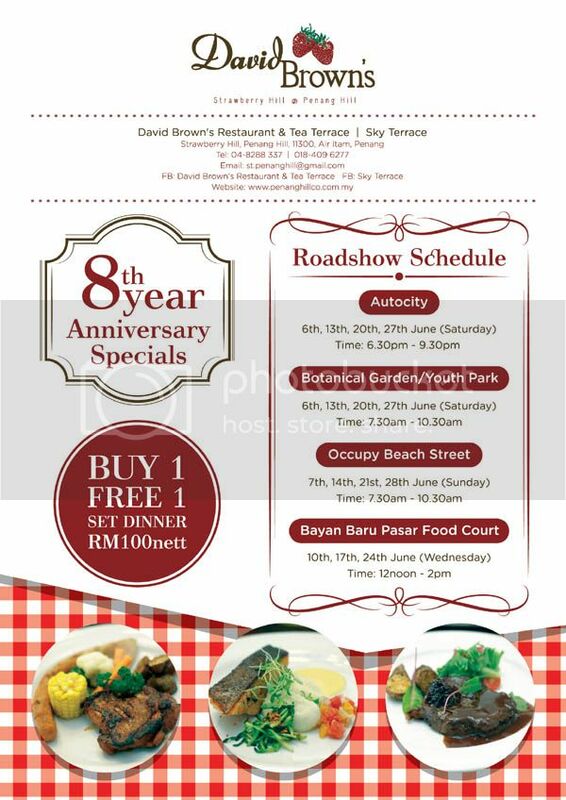 Now there’s a good reason for you to pay Penang Hill a visit as in conjunction with David Brown’s Restaurant & Tea Terrace’s 8th Anniversary, they are throwing in a superb set dinner deal for 2 pax at only RM100nett (regardless of nationality). The redemption period will be from June 2015 until 30 July 2015, excluding eve of public holiday and public holiday. Terms and conditions apply. However, the deal is solely for those who had purchased their voucher during their selected dated Road Show venues as shown below. Please take note that the vouchers won’t be on sale at the restaurant. Normal walk-in diners will be charged RM90++/pax for the set meal. Group purchases for the vouchers can be arranged by contacting the management in advance. Their Road Show Schedules are stated as below. 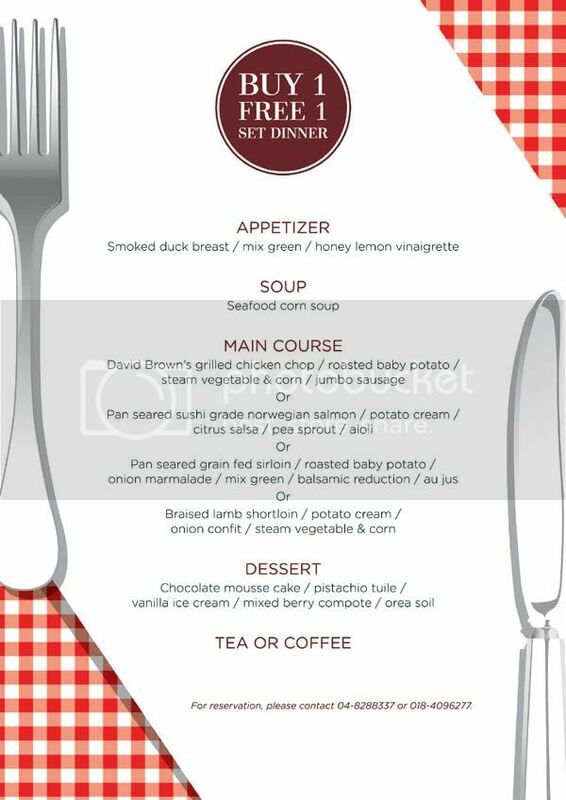 The menu for the Special Set Dinner for 2 Pax @ RM100nett is indeed value for its money as it’s a 4-course set dinner (appetizer, soup, main course & dessert) plus coffee or tea. Do enlarge the poster below for a clearer view. 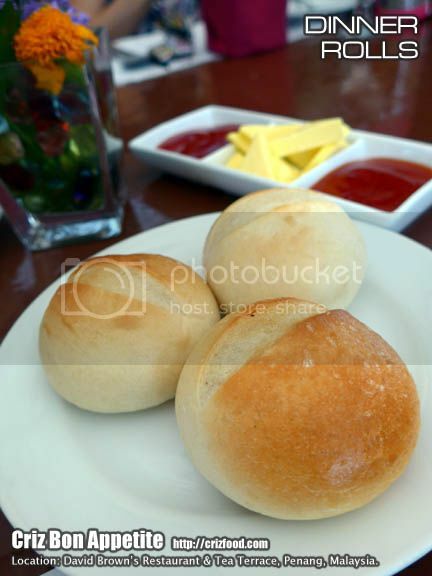 Prior to the start of our dinner, we were served with a bread roll each, accompanied with chili sauce, butter and tomato ketchup. I was just wondering who could be the Smart Alec who came out with this wasteful method of serving diners? Can’t we just have butter and save up the sauce until requested? Anyway, their warmly served in-house made buns were amazingly tasty and were rather compact compared to those served elsewhere. 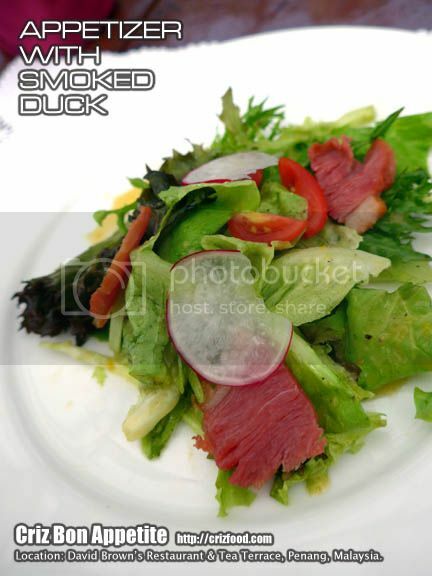 The first dish started off with an Appetizer of mixed green, dressed with honey lemon vinaigrette and topped with some slices of smoked duck. It was a palatable dish to start off the meal. This was followed with Seafood Corn Soup. 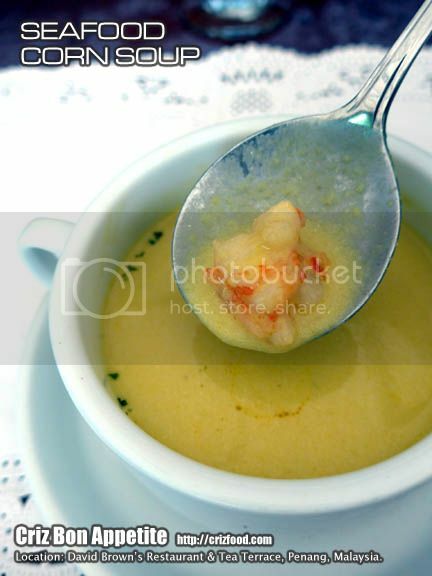 The soup had a rather unique combination of flavors with sweetness from the creamy corn kernels and a mild hint of lemongrass. It was garnished with some mixed herbs. The soup had chunks of scallops and prawn for the extra bites. Though the soup was to my liking, I somehow prefer diced fish fillet to replace the scallops as it would pep up the taste for the soup further. Some light sprinkles of paprika and chopped spring onions would be great add-ons too. We were given the options to choose one main course out of 4 options, namely poultry, fish, beef or lamb. 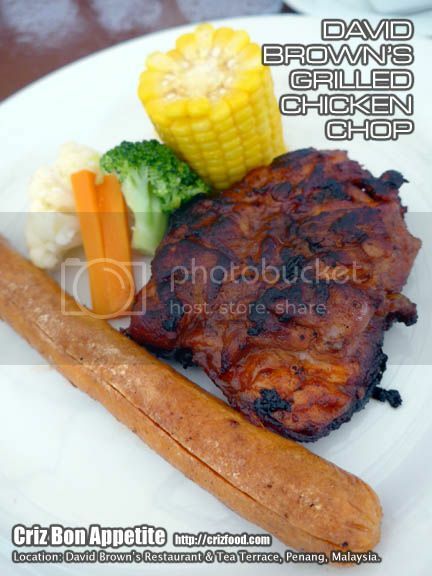 The first option was the David Brown’s Grilled Chicken Chop, served with roasted baby potato, steamed vegetables and a slice of corn cob with grilled jumbo sausage as bonus. The kitchen used their homemade BBQ sauce for the grilling and it came out quite perfect with the slightly burned after taste. It’s not a bad dish to order though. However, the bonus of jumbo sausage would need a bit of adjustment. Instead of directly grilled over the skillet, it could have gone through a process of boiling then grill to maintain the juiciness within. Alternatively, the kitchen could get the boil version as to maintain the yin and yang of the overall dish. I also do hope that the kitchen would look into having a small saucer of BBQ sauce or even some chicken jus for those who do not like their dish to be served so dry. 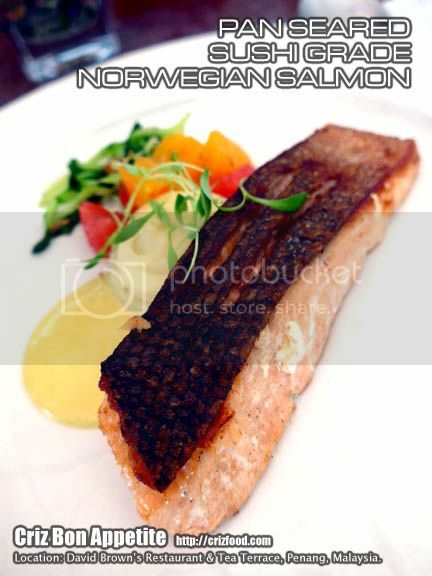 The second option was the Pan Seared Sushi Grade Norwegian Salmon, served with potato cream, citrus salsa, pea sprout and aioli. I like how the salmon fillet was pan seared to perfection with the flesh still juicy and the skin having that nice aromatic crispiness. The fresh egg based mild hint of lemon citrus flavor complemented the fish real well. 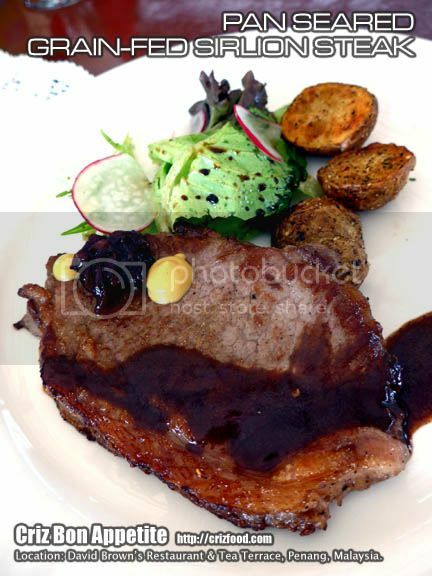 The third option was the Pan Seared Grain-fed Sirloin Steak served with roasted baby potatoes, onion marmalade, mixed green, balsamic reduction and au jus was also one of the most sought after dish amongst us. You could always ask the chef to cook it up to your preference such as medium-rare, medium or even well done (well.. I won’t recommend this option as it would toughen the meat). 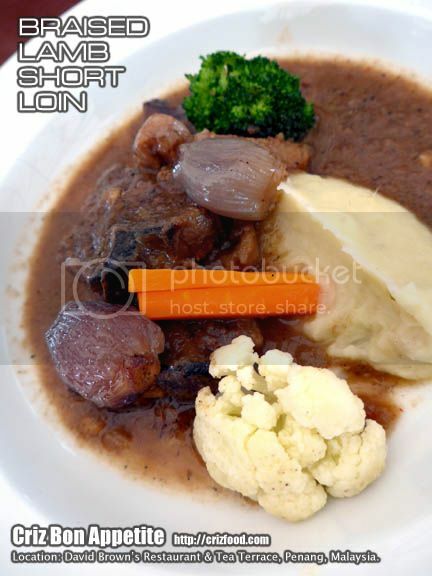 The fourth option would be the Braised Lamb Short Loin, served with potato cream, onion confiture and steamed vegetables. This was one of the more flavorful ones amongst the four options as all the flavors were extracted into the gravy. It had hints of apple sourness with a light touch of balsamic vinegar. However, the braising time of 3 hours for the lamb should be adjusted slightly lesser as the meat lost some of its biting texture. Overall, it was still a nice dish to savor over a glass of wine. Finally, it was dessert time with the serving of their mouth-dripping Chocolate Mousse Cake, skillfully decorated with a sweet flaky pistachio tuile, served with a scoop of vanilla ice cream on crumbled Oreo soil and mixed berry compote. It was heavenly and the whole combination had just the right sweetness to my liking. 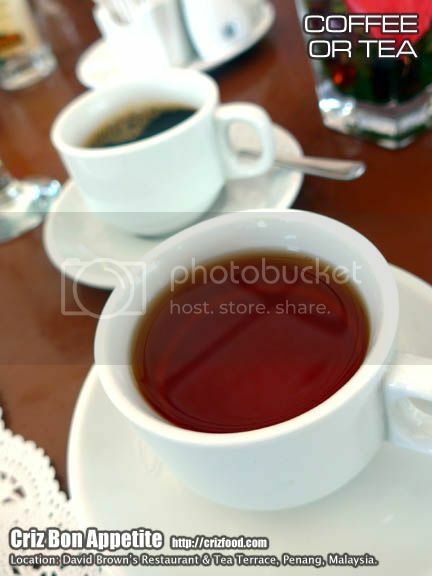 Lastly, you have the option to choose between Tea or Coffee to end your meal. For those who had missed out on purchasing their vouchers or having gone up during lunch time (11.00am-3.00pm), you could always check out their ala carte menu. One of their unique and signature dishes would be their Chicken & Mushroom Pie (RM48++). It’s one of its kinds in this region or maybe in the world. 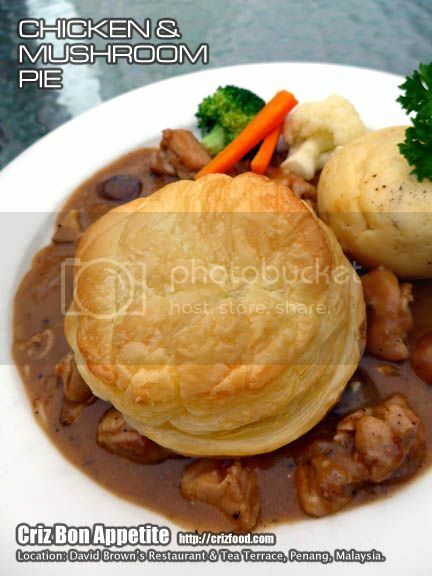 Instead of the normally enclosed filling of a pie, their version will consist of a plate of nicely stewed chicken chunks with mushroom, served with steamed vegetables plus a ball of mashed potatoes and topped with a freshly made puff pastry. Taste wise, it was just like the traditional style of cooking chicken stew with an add-on piece of butter infused flaky pastry. 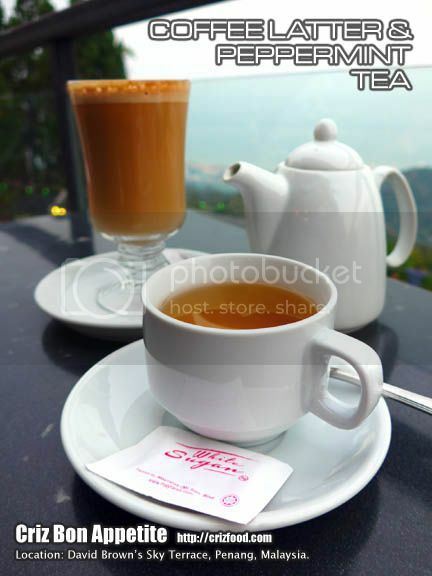 For those who would just love to enjoy the breezy cool air of the “hill on a hill” aka Strawberry Hill on Penang Hill, you could always come over to the restaurant their Afternoon Tea (3.00pm-6.00pm). 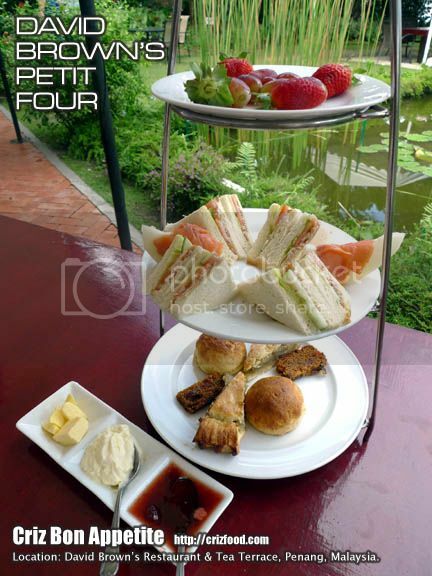 The most recommend and sought after set on their menu would be the David Brown’s Petit Four (for 2 pax – RM78++), serving you with their finest tea for two, fresh fruits, tarts, sandwiches, fruit cake and English scones with their homemade strawberry preserve and cream. So what would you do after a hearty dinner or even finding a place just to relax after a long walk around Penang Hill? 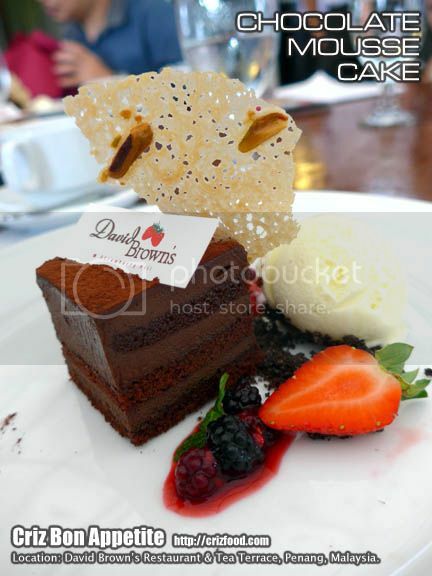 You can always laze about at David Brown’s Sky Terrace, one tier below the restaurant, over some light snacks and beverages. There will also be band performance during Friday, Saturday, Sunday and public holiday. They will operate from 9.00am until 11.00pm daily. Please do take note that the last train downhill will be at 11.00pm. Unless you are staying uphill for the night, do take heed of this reminder. On top of their English Breakfast Set Meal (RM25++), you can still order their Devonshire Cream Tea (RM25++) which would come with a pot of hot tea, 2 scones and their homemade strawberry preserve and cream. Do check out their cakes too. My recommendation would be their Tiramisu (RM15++). Since I was in the mood for watching the panoramic night scene, I stayed on over a pot of Peppermint Tea (RM12++) and a steaming hot cup of Coffee Latte (RM12++). I was impressed with their use of the Italian brand Caffe Vergnano Espresso Rico ‘700 which has an intense and full-bodied flavor with hints of chocolate finishing. This blend had just the right balance of fragrantly roasted Arabica combined with the rich and full-bodied Robusta. The Coffee Latte served here was one of the best milk-based espresso beverages I have tasted. 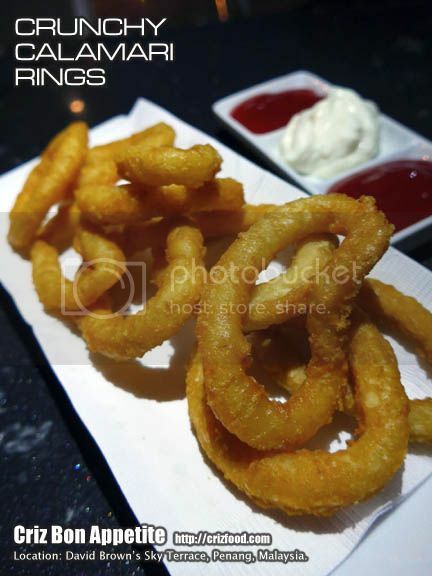 While waiting for the sky to get even darker for the perfect night lights shots, I was also munching some of their Crunchy Breaded Calamari Rings (RM20++), served with their homemade tartare sauce. It was nothing great to shout about but at least there was something to keep my mouth moving~ LOL! Overall, I do find some of the dishes served here to be quite impressive. However, there are still rooms for improvements, considering that time has changed and so do the taste buds of the diners out there. The simple and traditional way of preparing food might no longer attract diners of the younger generations. Price wise (other than the set dinner promotion which is a great bargain), some may find the menu pricing to be exorbitantly steep. As a Penangite, I would consider myself lucky having a cool, breezy and relaxing place to fall upon when I needed a short getaway to rid my body and mind from the stressful city life. 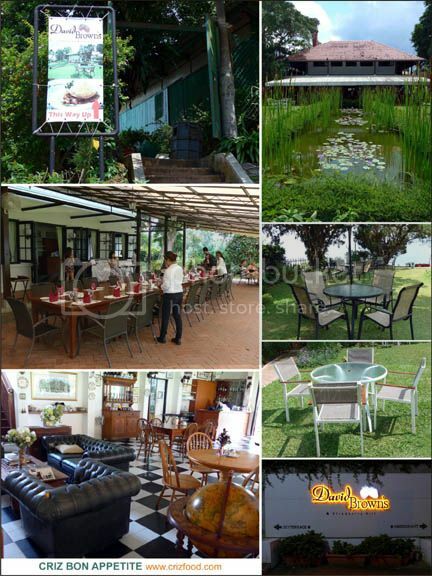 Compared to travelling to another hill resort outside Penang to dine out, don’t you think that it’s even cheaper to pay a friction of the travelling cost and pamper yourself more often like a King or Queen over some meals at David Brown’s Restaurant & Tea Terraces? The choice is yours. I rest my case.